I think it’s time to splash out on a luxury palette… It’s about time. I’ve never really been an eyeshadow kinda girl. I find all that too much of a hassle on a day-to-day basis and always opt for eyeliner and mascara. Maybe I’m just lazy. I don’t know about you but I find myself not wearing much eye make-up during the hot weather, fearing it might melt off (and it quite often does!) which is never a good look. For those of you in the UK, the weather has drastically changed from being in the mid 20 degrees to about early 20’s now. I’ve reluctantly dusted off my thin coat and forced myself to wear tights, even though I’m adamant that Summer will be back. Recently, I have been admiring natural eye shadow palettes that I just find stunning. The only eyeshadow palette that I own is the one from NYX. It’s good for everyday use, where I use the shimmery flesh toned colour (sorry it doesn’t have a name so you’ll have to put up with my brilliant colour describing skills!) all over my eye lid and then use an eye liner brush to pack on a dark brown eyeshadow onto my upper lower lash line. It does the job but I’ve been eyeing up a few luxury, high-end palettes that I think I might have to give in and invest in for nice evenings out. This is my favourite one by far. There’s a mixture of lights & darks and mattes & shimmers to suit every occasion. Imagine how amazing a subtle smokey eye with a slight shimmer running through it paired with a peachy understated lip would look on a night out? £48 does seem a bit steep for an eyeshadow palette but if it’s good quality and can last a long time, it would be totally be worth it. Now the price tag for this one seems a lot easier to take in! Although there are only 6 eyeshadows, you can create so many different looks with them. This might be more suited for day time looks as they are all matte. I’ve heard a lot of good reviews about these ‘Naked’ Palettes but they seem to be getting a bit repetitive now as they always bring out a second one with the most subtle changes in colour tones. So subtle that you probably wouldn’t notice the difference unless they were side by side – sorry Urban Decay! Speaking of which, the Naked 2 Basics has just come out..! Another pricey one. This palette looks so sleek and luxurious, I just want to get my hands on it. Now. The 3 matte shades on the left look very wearable and the shimmery ones on the right may have to only come out at night! I’ve never tried any makeup from Marc Jacobs before and it was only when this product was released into the blogging world a while back, that I even took any notice of make up by Marc Jacobs. I wouldn’t really class Too Faced as your typical luxury brand but the colours look so gorgeous, paired with the cute names. Can you tell that I get drawn in to those pinky, taupey, browny shades? It just looks like they would blend so well and seamlessly together. Again, you can create a ‘smoky but not too smoky’ eye and this would be perfect. I had to mention a Chanel palette otherwise my luxury wishlist wouldn’t be complete. It is very pricey for just 4 eyeshadows but they honestly blend so well together. Call me shallow, but there’s something very luxurious about applying makeup by Chanel. I'm sure I'm not the only one who thinks that. They are one of those well thought out purchases, never an impulse buy. Not for me anyway. Unless I’m in Duty free at the airport… Okay maybe I do make Chanel impulse buys. So there you have it. 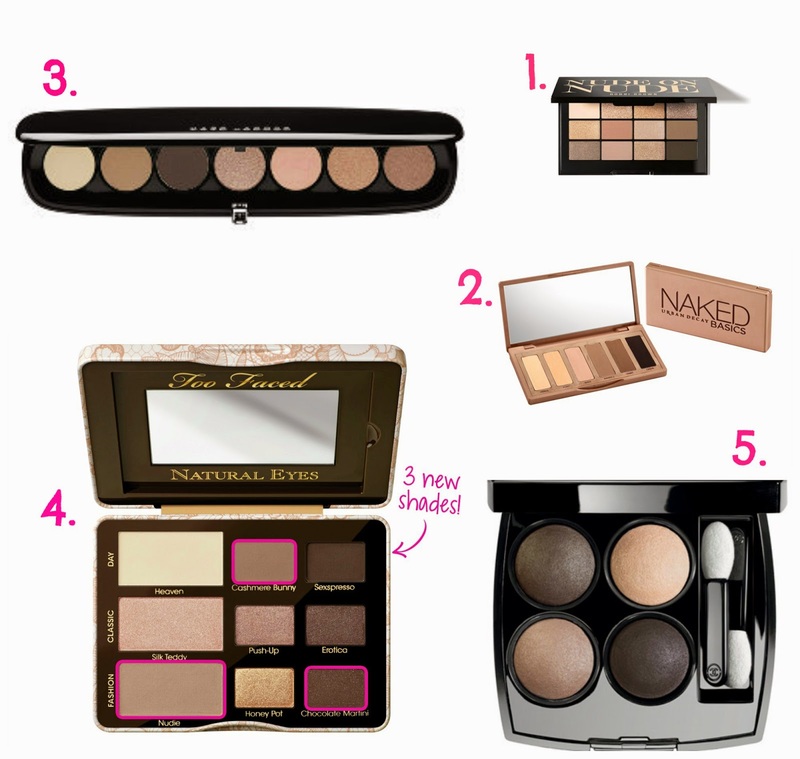 My top 5 eye palette wish list at the moment!